Blessed with an exceptional terroir, CHAMPAGNE DE SAINT-GALL takes a collective approach to implementing winemaking expertise passed down from generation to generation. Thanks to the unrelenting passion of its winegrowers and winemakers, CHAMPAGNE DE SAINT-GALL has honed its methods over time, to produce highly singular Grand Cru and Premier Cru Champagne wines of a pure, elegant style. Master craftsmen of the Chardonnay grape variety and experts when it comes to Pinot Noir, the men and women of CHAMPAGNE DE SAINT-GALL work to transform the region’s choicest grapes and vines into fine Champagne wines. They are united by a common passion for winemaking, a sense of duty and a desire to share this precious knowledge: they are the guardians of an invaluable legacy that must be carefully preserved as it is brought to fruition. The talented men and women of CHAMPAGNE DE SAINT-GALL are among its most valuable assets. CHAMPAGNE DE SAINT-GALL wines are the embodiment of their commitment, the result of more than fifty years of close collaboration within the UNION CHAMPAGNE group of cooperatives. A cooperative of cooperatives united by the pursuit of common values, UNION CHAMPAGNE was founded in 1966 by a set of Grand Cru and Premier Cru Champagne growers. It guarantees the supply of grapes sourced from the region’s most outstanding terroirs and the pooling of highly enlightened winemaking expertise. CHAMPAGNE DE SAINT-GALL was born of this shared desire and dedication. Crafted with precision from the choicest grapes, the wines of CHAMPAGNE DE SAINT-GALL perpetuate a philosophy based on an intimate understanding of, and an acutely exacting approach to, the craft of winemaking, coupled with the most forward-looking techniques. Today more than two thousand laborers, winegrowers, winemakers and oenologists from fourteen cooperatives share the same respect for tradition, openness to modern methods and attachment to authenticity and the quality of their work. Together they deploy their abilities and their energy to the pursuit of a common goal: joining forces to perpetuate the quintessential art of fine Champagne. CHAMPAGNE DE SAINT-GALL wines begin with the region’s choicest grapes, grown on some of Champagne’s most sought-after terroirs. Its Chardonnay and Pinot Noir grapes are cultivated on Grand Cru and Premier Cru terroirs stretching from the Côte des Blancs to the Montagne de Reims and the Vallée de la Marne in some of Champagne’s loveliest villages. The reputation of UNION CHAMPAGNE winemakers has long been based on the exceptional quality of its Chardonnay grapes. A unique treasure, the Chardonnay is meticulously crafted, finding its purest form of expression in the Blanc de Blancs wines of CHAMPAGNE DE SAINT-GALL. A careful selection and guaranteed supply of the best grapes from the most adapted terroirs, winemaking methods tailored to the particularities of each plot, incomparable knowledge of Chardonnay and an intimate understanding of Pinot Noir: this is the essence of the wines of CHAMPAGNE DE SAINT-GALL. CHAMPAGNE DE SAINT-GALL wines are crafted in facilities belonging to UNION CHAMPAGNE. Since its creation more than fifty years ago, UNION CHAMPAGNE has carefully perpetuated the great traditions of winemaking while embracing highly sophisticated methods to glorify the region’s finest grapes. Inaugurated in 2013, the vat rooms where CHAMPAGNE DE SAINT-GALL wines are produced combine an impressive aesthetic environment with advanced technology. They are located in the heart of the Champagne region in the village of Avize. To make the most of the singularities of each terroir and the expertise of their men and women, each cooperative vinifies its own grapes, resulting in a richly diverse palette of wines. 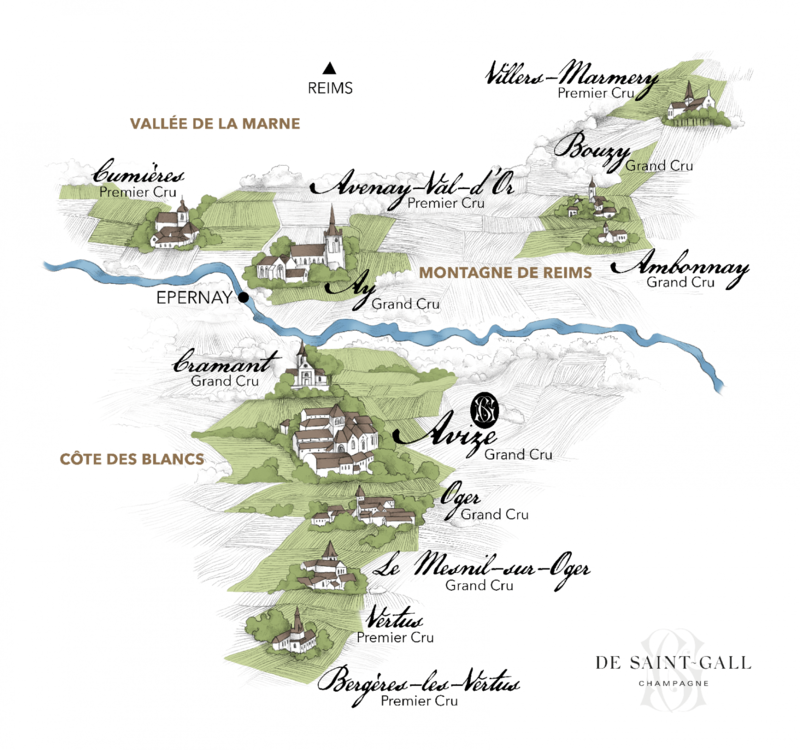 These wines are then assembled in Avize by the Cellar Master responsible for crafting the recognisable profile and style of each CHAMPAGNE DE SAINT-GALL wine. In bringing together integrated viticulture, a meticulous approach to each plot and the most advanced winemaking methods, CHAMPAGNE DE SAINT-GALL has reinvented the art of winemaking. Its vision is a decisively contemporary one, striking a balance between craftsmanship and technology in a ceaseless pursuit of excellence. Day in and day out, the men and women of CHAMPAGNE DE SAINT-GALL pursue a common vision as they deploy their talent and experience in the vineyards and the cellars. They are united by their passion and unwavering desire to bring this diversity of invaluable terroirs to the most perfect form of expression.